Pigeon Health has developed a fantastic new multivitamin and multi-mineral supplement range, designed to compliment the requirements of the pigeon throughout the vigorous the annual cycle. It is vitally important for our products not only to give that instant nutritional impact on a daily basis, but also work over a period of time to maximise the essential requirements to compliment good diet, good health, ultimate fitness and continued form. Pigeon Heath has developed this sophisticated range over the past 10 years and can confidently state that this optimum health range will enable your pigeons to excel at the many challenges facing pigeon racing today. Although the Pigeon Health Sport Vitamin range contains no fruit or vegetables it does supply the vitamins and essentials you would expect to obtain from a natural source. 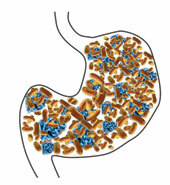 Probiotics and live yeasts go to work in the small and large intestines. Trusted around the world to help support healthy digestion, provide a natural defence and help maintain optimum health and wellness. The small intestine is responsible for breaking down food, absorbing nutrients into the body, and getting rid of what is not useful. The small intestine has a large surface area that allows for efficient nutrient absorption. Because of the large surface area of the small intestine, the majority of the immune function within the digestive tract happens here. This is where the digestive system works really hard to keep bad things out. These digestive bacteria are essential to overall well being. Probiotics and live yeasts work in harmony acting as a helper to the friendly bacteria, by keeping the digestive system functioning well. Pigeon Health is able to provide natural cereal grass oils from one of the leading specialists in seed oil development. Pigeon Health specialises in five main oils which are essential for pigeons. The seeds undergo a cold press process which expels the oil and keeps the nutritional value to an optimum level.